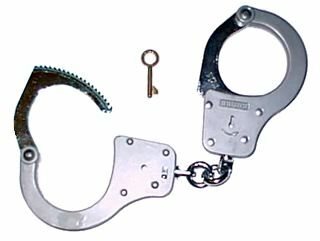 These are the "standard" (as in not high security) version of the Chubb cuff. They are known as "Detainer" or "Arrest." The key is a 3-lever solid post. Double locking can be accomplished either by turning the key in the clockwise direction a whole revolution or by pushing the double locking actuating knob at the base of the cuff with a finger. Unlocking is accomplished by turning the key counter-clockwise. To double unlock the key must be turned counter-clockwise one and half times. There are two ratchets side by side and a single groove on the bow with matching ridge in the cuff body. These two features add security to the cuff. Finish: Body - Glass Bead Blasted and Clear acquered. Ratchet Arms, Chain Links, Swivels and Pins - Nickel Plated. Body Castings - LM24 Aluminium Pressyure Die Castings. Ratchet Arm - Mild Steel Chrome Plated. Keys - High Tensile Brass.